enter at Svante Arrhenius väg 20 F.
You find us on the 5th floor at the Baltic Sea Centre(Östersjöcentrum). You can travel by the metro (underground/subway) from the central station in Stockholm (T-centralen). Take the red line northbound to Mörby Centrum and get off at the station "Universitetet". The journey takes about 10 minutes. Take bus 50 or 670. Get off at the station Universitetet. Turn from E18 (Roslagsvägen) at the University. 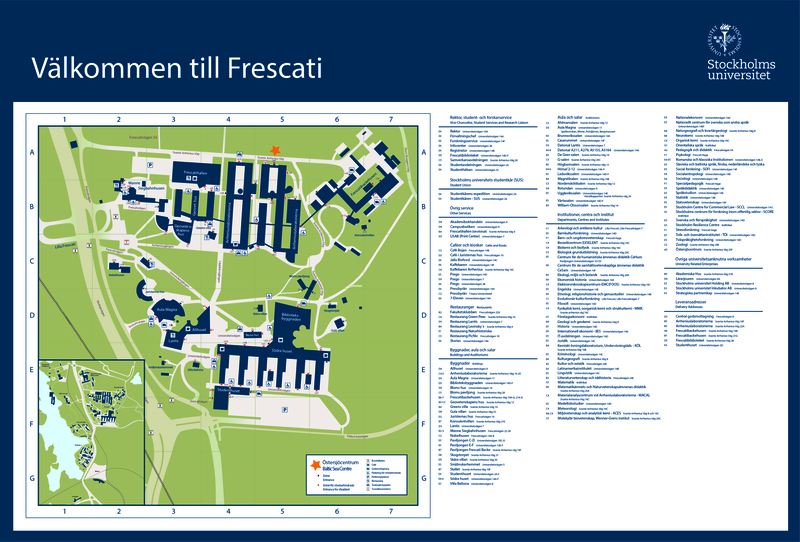 Follow “Frescativägen” and take “Svante Arrhenius väg” (between campus and the Swedish Museum of Natural History). Our building is past the sports hall and right before the park area starts. The facade is grey and has red window frames. Airport coaches leave Arlanda airport (Stockholm's international airport) every 5-10 minutes for the City Terminal in central Stockholm. The bus ride takes approximately 35 minutes and costs SEK 119 (99 SEK Internet price). Please visit www.flygbussarna.se for further information. From Arlanda Airport there is a direct train connection to the Stockholm Central Station, the Arlanda Express Train. The journey takes about 20 minutes, cost SEK 280 (540 SEK return). The train leaves every 15 minutes from Arlanda Airport, and is specially designed with extra space for luggage. Please visit www.arlandaexpress.se for further information. Taxis are available outside the arrival hall at Arlanda airport. Prices may vary considerably, so you are advised to ask for the price before entering the taxi. Many taxi companies offer a fixed price of SEK 495 from Arlanda airport to Stockholm city centre (SEK 495-520 from Stockholm city centre to Arlanda airport) and the driver is obliged to give you a printed receipt on request (as of May 2010). Airport coaches leave Bromma airport for the City Terminal in central Stockholm. The bus ride takes approximately 20 minutes and costs SEK 79 (May 2010). Please visit www.flygbussarna.se for further information. Taxis are available outside the arrival hall at Bromma airport.